Mwinelubemba Chitumukulu Kanyata Manga II after being crowned at Mwenda ngombe during the installation ceremony . The ceremony was attended by president Edgar Lungu. Paramount Chief Chitimukulu of the Bemba people in Northern Province has urged media personnel to be responsible in their reporting as the country heads to the August 11 polls. Chief Chitimukulu says journalists should be factual in their writing and avoid fuelling hatred in the nation ahead of the elections. He bemoaned the seemingly growing trend of misrepresenting facts among some media practitioners in the country. The Mwinelubemba observed that if left unchecked, spreading of twisted information could lead to political strife. He has since advised journalists to uphold professionalism in their work especially during campaigns for the forthcoming general elections. Meanwhile, the traditional leader has appealed to political parties who intend to form alliances ahead of the elections to consult widely before making binding agreements. 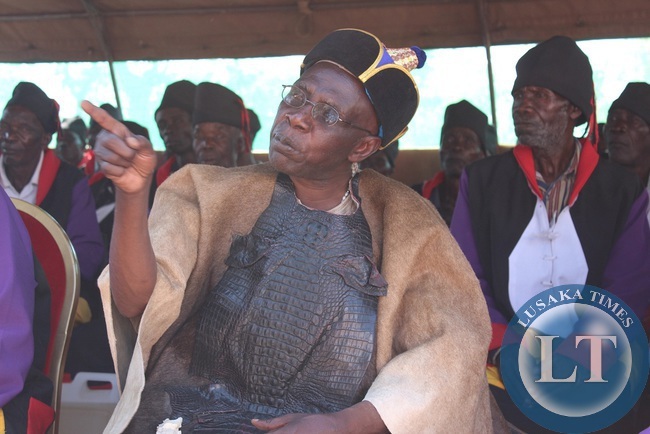 In another development, Paramount Chief Chitimukulu has implored on people who have not yet registered as voters to take advantage of the voter registration at civic centres. And the Paramount Chief has called for peaceful campaigns ahead of this year’s tripartite elections. The Chitimukulu made the remarks when PF aspiring candidate for Kasama Central Constituency Kelvin Sampa paid a courtesy call on him at his palace yesterday. And Mr Sampa assured the Mwinelubemba that the ruling party will continue to preach peace ahead of the elections. Meanwhile, Mr Sampa has praised the Catholic Church for its continued partnership with government in providing health care services. Mr Sampa, who is also PF Kasama Central Aspiring candidate, said the church should be commended for its efforts in helping people especially in rural areas to access health services. He said this when he presented a donation of bed linen and blankets worth K30, 000 to St. Fidelis Mission Hospital in Kasama’s Chilubula area yesterday. Mr. Sampa added that there is need for well-meaning citizens to supplement the provision of medical care as a way of helping the under-privileged. He observed that the PF government has demonstrated leadership in improving health care delivery adding that the move should be emulated by other well-wishers. And St. Fidelis Mission Hospital Sister in-charge Charity Chishimba thanked Mr Sampa for the donation. Dr. Chishimba said the institution is faced with a number of challenges which require the help of other stakeholders in addressing them. She however hailed government for the continuous support it renders to the institution. ..especially Times of Zambia,Daily Mail, Daily Nation and ZBS (ZNBC).The rest eg,zambianwatchdog,The Post and Metro are okey as they report the facts as they are on the ground. Atase zwd amafi ya ngombe yekayeka. You must be a T to support the crap zwd reports. That’s a tribal and hate conduit for HH. The Zambian Watchdog, the Post etc report only news that is inimical or bad to the government which may be factual but leaves out the good news that reflects well on government. A visitor from Mars would think that there is only bad news in the country. The government media report only on good news and fear to report on bad news because their jobs might be compromised. As for the Daily Nation there is bad blood between it and the Post and they oppose each others opinion. If the Post writes a story condemning government the Daily Nation will rise to its defence. Who does not know the forked tongue of that serpent Mmmembe? Every right thinking Zambian from across all parties now understands If you have followed the Post since 1990 you will see the total contradiction of what he says and what he has said, somehow he thinks Zambians are so daft that they don’t see this…..and Mr HH either is too blind to see that Mmembe is a big cost to his election campaign or he is just confirming that he remains an underfive in politics……stunted political brains as they say. @ cruz- what a pathetic numb skull! ZWD and The ‘Past’ are morbid news sources for upnd goons and dweebs! The more you associate with these rabid media’s, the more you de-campaign your tribal leader- jerkers! Unfortunately, upnd seems to think that people’s opinion can be swayed through mud slinging and false opinion polls, plus the new tactic of ‘international appeal at false forums where Under 5 slings filthy at the country- give us a break! We’re smarter than you see us- now Tribal leader has added a few goons to the equuation- Orange alliance- hoping to dent the good name of Bembas and reduce it to the level of Southern tribalists- sorry bane’, we ain’t buying that nonse! It seems 19:37:54 has been invaded by up end goons with false statistical representations of ‘likes’! Yaba- the same ole stale losing tactics! Why not just the post newspaper. we all know its the post that distorts the news followed by MUVI TV. Muvi TV has been lowered by that short dweeb Costa and it now serves the freemansory man who’s trying to bring back Anglo America which abandoned us at our time of need- what a farce the tribal leader brings unto us! Nega nega 2o16! Hh ought to ‘hit’ the political retirement bucket and revisit his tribal election!